What do you say when you give your heart away? How do you describe it? What words do you choose? We began our wine journey in Napa Valley. We loved wines and wanted to understand them. So we decided to begin with a region we could travel to fairly easily and get to know first-hand. With young kids, France, Italy and Australia seemed far-fetched goals. So we started closer to home. The Napa Valley has proven its mettle many times over against the world’s best wines. It was as worthy a place to begin as any. And only a short plane ride away. Our first trip took us through Napa, St. Helena, up to Spring Mountain (oh that mountain Cabernet! ), on to Rutherford, Oakville and Calistoga. The next year we ventured to Sonoma, starting outside of Santa Rosa, stopping by Martinelli, heading up Westside Road into Healdsburg and making it as far north as Silver Oak on the Sonoma side (Geyersville). Something beautiful happened as we got further out from the busiest centers of wine country. The crowds were less onerous. The winemakers were more often present in the tasting rooms. No giant tour buses parked outside. And we often got to sip and chat with the people who knew the wines best– those who were making them. We were welcomed in a personal way that made us feel at home. We were starting to find our niche in wine country. Returning from that second wine country trip, I was perusing our maps and noticed an area called the Anderson Valley, just a bit further than the far reaches of Sonoma. It was purported to be “like Napa and Sonoma used to be”– less commercialized, yet populated with good people passionate about making good wine. And it was said to be a gorgeous valley with idyllic views. We fell in love with it before we even set foot there. The busy-ness of life prevented us from getting back to wine country as quickly as we would have wished. 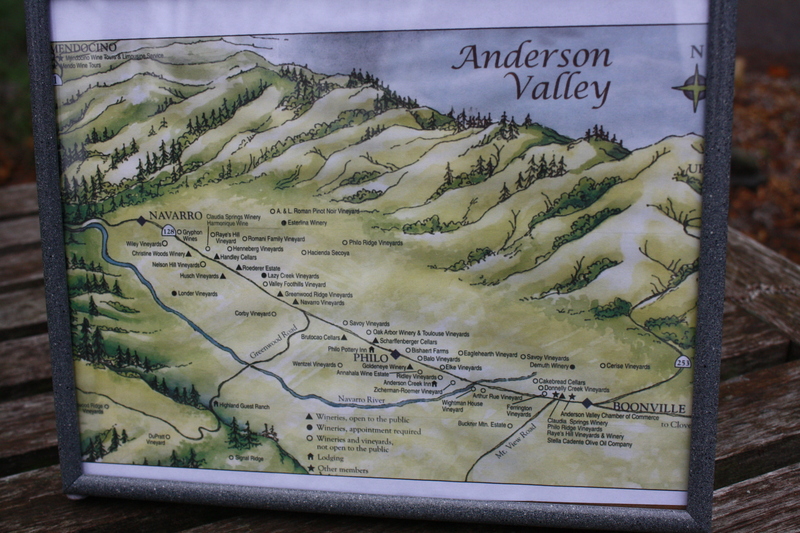 In the year or two that followed, I printed an Anderson Valley map and framed it to hang above my desk for inspiration. Kip and I began tasting wines from the valley whenever we could find them in our local stores or restaurants. If we couldn’t go there, we reasoned, we could certainly get to know the area by tasting their vintages. The soil, the weather, the people who labored over the production– it was all wrapped up in the bottles on the shelves of our local wine stores. Sooner or later, we did make it back to wine country and visited the Anderson Valley in person. A narrow, winding roadway starts at one end of the valley, with trees arching over like a tunnel. Tall redwoods at the other end and open views of gorgeous hillsides. Cool fog that hovers each morning and lifts to reveal the valley and hilltops like magic. Friendly people with interesting stories. Talented winemakers whose wines have been praised by Wine Spectator and other noted wine reviewers. Many wine appreciators meandering the tasting rooms just like us– good company– but not the crowds to fend off, like in the thick of Napa. For us, it was perfect. We’ve now been back more times than we can count. Sure, we still enjoy stopping through Sonoma on the way north, often veering off to Healdsburg for a meal and shopping en route. We usually intend to get to Napa, yet less often do. But when we get to the Anderson Valley, we always let out our breath, sigh happily, and know that we have arrived in the small corner of wine country that suits us best. Wineries are listed in the order in which you’d pass them if you took Highway 101 north from San Francisco to Cloverdale and headed west on Highway 128. We begin in the Yorkville Highlands (even though it is technically adjacent to, not part of Anderson Valley) and continue through Boonville, Philo and Navarro. Yes, there are many other great wineries in the valley. If they are not on our list, it probably just means we haven’t been there personally, yet. Tell us if you have a favorite and we’ll make it a priority because we’re always planning our next trip. Meyer Family Cellars – Delicious dark, rich Cabs and Syrah. A lovely port, as well. Wine maker Matt Meyer is son of Justin Meyer, co-founder of Silver Oak Winery, and was raised in the business. His wife Karen Meyer, a native of Australia, brings her heritage to the winery. Mom Bonny Meyer is also part of the family operation. Londer Vineyards – OK, we have not actually visited their Boonville tasting room. But we have sipped their wonderful Pinot Noir in restaurants in the area. People in those restaurants speak highly not just of the wine but of the Londers. It always makes us feel good to sip good wine made by good people. We’re eager to visit them. Goldeneye Winery – An elegant tasting. Owned by Duckhorn Wine Company, Goldeneye charges a fee, which most others don’t in the valley. But they do have a beautiful back patio AND you can walk the vineyards behind the winery AND and they serve excellent, vineyard specific Pinot Noir and even give you a little food to accompany the wine AND you can linger as long as you wish. Greenwood Ridge Vineyards – Operating on solar power, and making a wide variety of good wines from Pinot Noir, Syrah, Merlot and Zinfandel to Sauvignon Blanc and Reisling, Greenwood Ridge also started an amateur baseball team, the Dragons, who have an impressive record. Fun people. Good wines. Navarro Vineyards – Family owned and making wine since the mid 1970’s, Navarro produces wines that are both affordably priced and lovely to sip. (Pinot Noir, Grenache, Syrah, Zinfandel, Gewurtztraminer and more). Friendly tasting room, beautiful setting. Husch Vineyards – Oldest winery in the Anderson Valley appellation. Small, family owned and operated. Wide variety of wines. Great quality. Great prices. Cute tasting room in a tiny, rustic outbuilding– a converted pony barn with flowering vines covering the outside. Scharffenberger Cellars – Bubbly! Started by John Scharffenberger, who went on to found the successful chocolate company that still bears his name. Now owned by French champagne house Roederer, but still with local charm, featuring art work from area artists in the tasting room. We’re glad you like visiting Mendocino County. We started looking for a property the week after our first long visit. Edward, So fun to hear that your reaction to the Anderson Valley was similar to ours– smitten quickly when you first saw it. Your tasting room is one of our first stops on most every trip and we eagerly await your wine club shipments to keep us stocked at home. After a few years of visiting, we found a small parcel of land on a gently rolling hillside close to Ukiah. Nothing on it at the moment except beautiful views. We look forward to building in a few years. Until then, we visit as often as we can. Cheers! Hoping to make it out there in a couple of days! Thanks for the winery suggestions, will definitely try and visit a few of them. Very excited that you might get out there in just a few days! Do give a holler back and let us know where you went and what you thought. We have not ventured out of Napa or Sonoma on our last few trips but I feel like the Anderson Valley is calling my name. You certainly give an enticing endorsement! Thanks for the note, Nick! Would love to hear about it if you do get to the Anderson Valley. It is a wonderful continuation of the wine journey. And not far from the Mendocino Coast, so makes a great stop en route to the ocean.